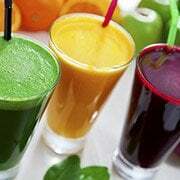 Smoothies are a wonderful way to include a variety of nutrients into your diet. This recipe is full of potassium, fiber, calcium, and energizing B vitamins. Try drinking it first thing in the morning as a nourishing way to get you through your day! Using the Kuvings Smoothie Strainer, add all ingredients to juicer and process until smooth.